Dog Sitting | Are you there..? It is day one of our dog sitting escapades. Abe is in his element. He’s been asking for a Chihuahua for nigh on 6 months, ever since we saw an article in his Grandparent’s newspaper, commenting on the amount of ‘handbag dogs’ now abandoned and living in Battersea Dog’s home. Not the breed I imagine to live there. I picture Pit Bulls and cockney Bulldogs, like Bullseye from Oliver Twist, with their gob irons playing mournful tunes and tattooing each other’s faces and paws. 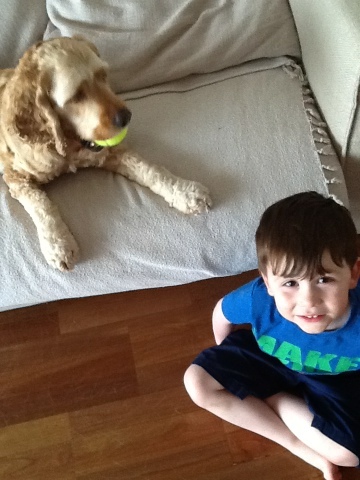 As I watch Abe playing with Bert and the tennis ball, Bert licks Abe’s face. “No Bert! You lick your own willy”. Ah ha, so he does listen after all. Also Bert is put on the step for one minute for chewing on a cushion, a new skill the dog’s acquired while in our care, and proof that Supernanny has made some kind of an impact. The dog sitting is an overall success, the maid doesn’t quit and neither dog leaps to their death off the balcony. There have been highs and lows, but its been a major love-in of Lennon/Ono proportions. If this had been a test to decide whether we are ready for a pooch in our lives, the answer is not yet, but it will happen. Abe and Patti are obsessed, talking about the dogs with the levels of love they express when we talk about their Grandparents and their little mates back home. The day after feels like a comedown. Next:Lumphini Park: What did you do there?